Find out why we urge chefs to use our top local ingredients to ensure our clients get the tastiest, freshest options for their office catering. There are numerous reasons to eat foods that are in season, from supporting your local community to saving money and helping protect the environment. You also get the tastiest, freshest produce when you buy in season; foods are harvested at their peak ripeness, allowing them to retain the most flavor and maximum level of nutrients. A crisp apple on a cool fall day or a juicy, ripe watermelon in the summer tastes better than they would any other time of year. While we are lucky enough to be able to purchase most fruits and veggies year-round, buying produce out of season requires extra time and resources to import the food. That’s why raspberries in the winter are more expensive and lower in quality than they would be in the summer. One of the best ways to expose yourself to seasonal foods is to visit a local farmers’ market – many of which are even open in the winter! Another great option is to subscribe to a community-supported agriculture (CSA). A CSA is a network of individuals who support one or more local farms. When you join a CSA, you pay a fixed fee for the season and get to visit the farm or pick-up location to select a variety of fresh produce every week. Finding fresh produce at your local farmers’ market also helps promote variety in your eating patterns by encouraging you to try out new, unfamiliar foods. January and February are good months for cruciferous vegetables such as cauliflower, Brussels sprouts, broccoli, and arugula. These veggies are rich in antioxidants and fiber, and are known for reducing your risk of cancer and chronic disease. Potatoes, parsnips, and winter squash are also in season this time of year and make for great warming stews on a cold winter day. The best fruit options this time of year include citrus fruits, such as oranges, grapefruits, lemons and limes, and persimmons. Fuyu persimmons (a variety of persimmon with a mildly sweet, almost honey-like flavor) are one of my favorite office snacks in the winter. They are high in fiber and vitamin A, and are juicy and crisp, like an apple, so can be eaten on their own. I also enjoy slicing up fresh oranges into sparkling water for a healthy, naturally flavorful beverage. The Center for Urban Education about Sustainable Agriculture (CUESA) is a great resource to find out the best seasonal options in California each month. Another great resource for learning what’s in season is the website for the Fruits and Veggies — More MattersⓇ health initiative. As a registered dietitian at an office catering company, I work directly with local chefs to develop healthier versions of their traditional recipes. 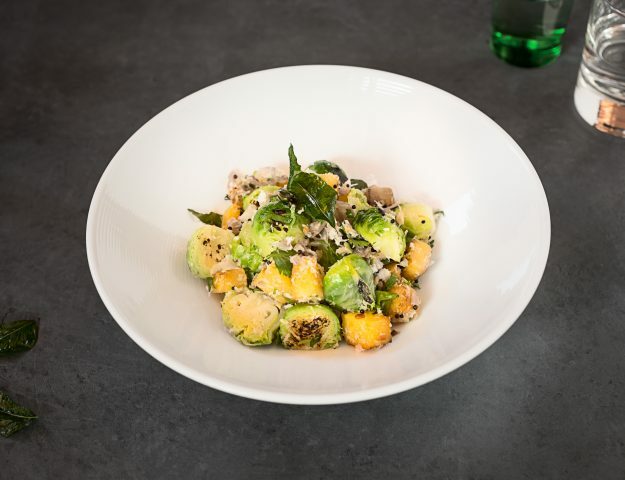 One of Zesty’s top restaurant partners, DOSA, regularly swaps out ingredients in their poriyal dish to feature seasonal vegetables, which currently showcases a unique and flavorful twist on Brussels sprouts. This veggie dish is one of our favorite sides to serve with our for office lunches and office dinners from DOSA. One of the favorite parts of my job is encouraging the movement to support local farms and promote seasonal recipes. We urge chefs to use our top local ingredients to ensure our clients get the tastiest, freshest options for their office catering. Seasonal eating isn’t only limited to produce – you can also find meat, poultry, and fish at farmers’ markets and can ensure the same high quality, lower carbon footprint you would get with buying seasonal produce! What’s your favorite seasonal winter food? Oops! Something went wrong while submitting the form. Please try again! Thank you for your interest in Zesty. Sign up to our newsletter to stay current on the latest news and information about the company and to be the first to see new blog posts.